Latvians Online – Ikkatram latvietim pasaulē. Over the past few years I’ve come across many flashcard and vocabulary-building software, but only recently have discovered an App, which has the potential to transform the way Latvian is taught to newcomers of the language. Developed by Grasshopper Apps, Bitsboard is the culmination of over 3 years of creating educational Apps for tablet computers. What sets their latest creation, Bitsboard apart from all other flashcard Apps is its ease of use, the professional-looking user interface, beautiful imagery and sounds, and the ability to customize for just about any language, including Latvian. Within minutes of downloading the App you can be creating your own words, adding matching photos and recording your audio for each item. 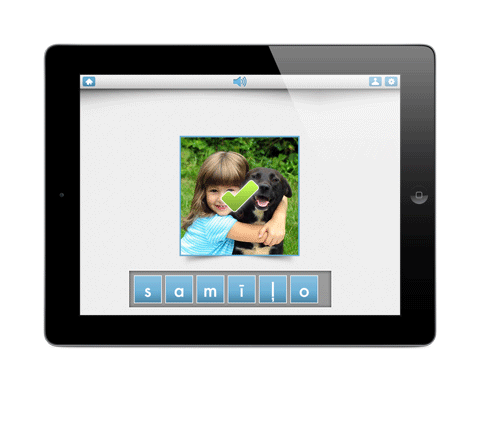 Bitsboard currently includes three activities: Flashcards, Photo Touch and Word Builder. Word Builder will scramble letters or words at the top of the screen and ask you to rearrange them to match the picture. A new activity Match Up where you match words to pictures is expected in the coming weeks. With its flexible visual and audio features Bitsboard could easily be extended beyond vocabulary exercises – what about number counting, learning to tell the time, recognising Latvian castles, testing your knowledge on Latvian traditional foods or even identifying the face of a famous Latvian musician, historian or politician? The Latvian School in Melbourne, Australia has been using the “Little Speller” and “Sentence Maker” Apps, both of which have now been integrated into Bitsboard. Up until now the biggest limitation was not being able to share your created flashcards with others easily. Bitsboard now takes it to a completely new level by being able to publish your flashcards to the cloud-based Catalog and share it with everyone else – a growing collection of over 100,000 picture and audio-based flashcards. 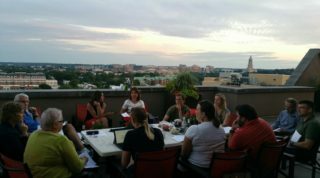 Now imagine the possibilities for those teaching or learning the Latvian language. A mother could be creating a fun Latvian game for her toddler son spoken in her own voice and be able to share this with another family with lesser Latvian language skills; a student could create his own challenge list to consistently practice the more difficult Latvian words; a teacher could be at home creating a spelling board for students to upload to their iPads at their next Latvian grammar lesson; a school could establish a curriculum based on vocabulary lists taught at each school year level using fun and engaging technology; educational providers could be creating formal and customized content instantly accessible to Latvian schools and individuals around the globe. The best thing about Bitsboard is that it is available free from the App Store. All you need is either an iPad or iPad mini running iOS 5.0 or newer version. An iPhone version is also in the works, but there is no word yet about an Android version. For those that have already downloaded Bitsboard and are keen to get started – a quick tip. The online Catalog currently seems to be searchable by title only, so when you create a new board include “Latvian – “ or “Latviešu – “ at the beginning of your board title. Similarly if you would like to discover what is already out there just type in either of these two words into the Bitsboard Catalog search box. Have fun and start to learn Latvian the new collaborative way. Please contact us for editorial queries, or for permission to republish material. Disclaimer: The content of Web sites to which Latvians Online provides links does not necessarily reflect the opinion of Latvians Online, its staff or its sponsors. It is great to see this. Currently teaching Latvian to my friend but as I have not spoken it in years having to look up my grammar. It is not clear to me from the description if this app comes pre-loaded with Latvian vocabulary, or if one (parent or grandparent) needs to create this from scratch. If so, that sounds like a huge task.